With much of the U.S. wastewater and sewer infrastructure becoming up to 100 years old, experts agree that the foundation must be rehabilitated to remain in use for a growing population. Municipal wastewater treatment facilities, sewers, and vaults endure some of the most severe and corrosive environments in the water industry. In recent years, these facilities also have been forced to pass increasing scrutiny from the Environmental Protection Agency (EPA) (Washington, DC). At industrial plants, the EPA enforces requirements to ensure that operators pretreat pollutants in their wastes to protect local sanitary sewers and wastewater treatment plants. 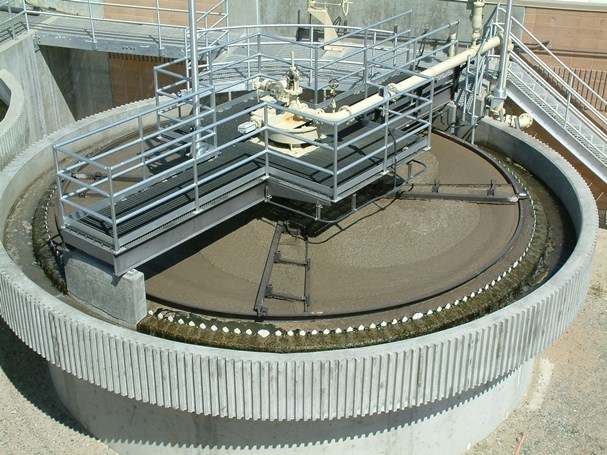 Such extreme wastewater handling environments operate under continual chemical exposure and heavy abrasion that deteriorate concrete and corrode steel in clarifiers, containment pits, anaerobic digesters, utility holes, tanks, and other infrastructure assets. A variety of factors can cause these structures to develop sizable cracks, through which wastewater can escape by exfiltration. Groundwater could also enter the wastewater system through infiltration. Cracks can form in aging concrete wastewater infrastructure for many reasons, including earth movements or daily and seasonal temperature changes that cause expansion and contraction, such as freeze-thaw. Additionally, harsh chemicals used to treat wastewater can deteriorate the concrete, as can exposure to hydrogen sulfide (H2S) gas, a form of sulfuric acid (H2SO4) present in sewers created by anaerobic organisms. Leaks, cracks, and damage to existing coating systems not only top the list of challenges in facility maintenance and new construction but can also trigger severe financial penalties. Since the EPA regulates municipal wastewater and stormwater management, concrete cracks or leaks that lead to wastewater exfiltration or groundwater infiltration can put the municipality in violation of a judicial consent decree. If the EPA finds that a municipality has old leaking sewer systems, putting them on a consent decree can mean that they don’t receive federal tax money until the problem is fixed. Cracks can develop in a wide range of aging concrete infrastructure facilities. A cement material is traditionally used to repair wastewater-related sewer leaks. But this process has disadvantages, as does the use of other coating materials. For concrete repairs in wastewater infrastructure from local utility holes and lift stations to clarifiers, trenches, and sumps, we transitioned to an advanced polyurea system. Hydrogen sulfide [H2S] gas eats away at the cement in sewer concrete, so it may only have a lifespan of a few years. Because much lower elongation properties limit epoxies, they crack and don’t bridge cracks well. Polyurethanes have more elongation, but nothing like polyureas do. Advanced polyurea coatings and liners are proving ideal for wastewater infrastructure rehabilitation by delivering secure, flexible, abrasion- and chemical-resistant waterproofing that not only bridges existing cracks but can elongate up to 400% without cracking. 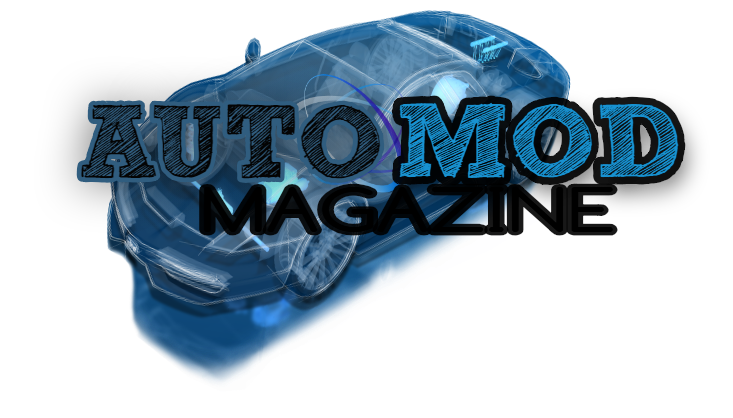 Because these systems set and cure rapidly and can be installed and used in many temperatures, they also minimize downtime. The spray-applied waterproof coating creates a seamless, waterproof, durable protective liner that stops leaks and strengthens the integrity of the entire structure. It exhibits superior physical characteristics such as elongation up to 400%, cracks bridging, hardness, and tensile strength to create a robust industrial liner that protects, strengthens, and waterproofs the infrastructure. A number of the polyurea’s features help to extend wastewater infrastructure durability, as well as prevent wastewater exfiltration and groundwater infiltration. Since the polyurea system provides superior elongation, it bridges cracks up to 0.125 in [3.18 mm]. With tensile strength higher than traditional materials, it has much lower permeability for better waterproofing. Its impact, abrasion, and chemical resistance are excellent, so it resists hydrogen sulfide. Instead of years between the replacement of cementitious coatings, the polyurea coating can cost-effectively provide decades of protection. With proper crack repair and surface preparation, the polyurea coating can be a thick film applied directly to the concrete. An alternative application method that can sometimes mitigate the need for a surface or crack repairs is to pre-spray the polyurea to geotextile fabric panels placed on top of the substrate and fuse the panel edges together with more polyurea. Because of the polyurea’s ability to set and cure quickly, it also minimizes wastewater treatment plant or infrastructure downtime. This can translate into thousands of dollars of savings per hour, all while avoiding days of service interruption. 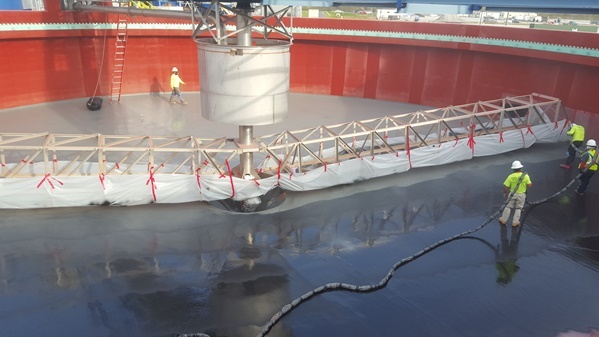 In one recent case, when large cracks were found in a concrete clarifier shortly before a chemical plant’s ribbon-cutting ceremony, we turned to polyurea for superior protection and fast installation. After repairing all cracks over 0.125-in wide in the clarifier with a concrete repair grout, we prepared and primed the floor and walls with the manufacturer’s primer. We then applied 80 to 100 mils (2,032 to 2,540 µm) of polyurea. The polyurea allowed us to provide a warranty against potential future cracks opening in the concrete because of its crack bridging ability. We were able to spray the polyurea as thick as needed in one application. Since it sets and cures rapidly, structures can put be back in service very soon after spraying. While traditional coatings such as cementitious, and polyurethanes will prematurely fail if not installed under a relatively narrow range of temperatures, the polyurea used is designed for installation and use from -40 to 350 °F (-40 to 176.7 °C). It will withstand decades of freeze-thaw cycling and wide disparities of temperature and humidity. The polyurea coating system used can be applied in a broader range of temperature and humidity conditions than rival coatings. The polyurea coating system used by ArmorThane can be applied in a broader range of temperature and humidity conditions than rival coatings. When you’re aboveground in the Midwest, you have frozen and thaw with concrete expansion, contraction, and cracking. We needed a lining that would move with the structure through the different seasons and tank temperature differentials. For that, polyurea works very well. To withstand extreme weather conditions at a northern Indiana wastewater treatment plant, we selected polyurea for a secondary containment area around ferric chloride tanks. After filling in cracks with grout and restoring the concrete, we sprayed the polyurea on geotextile to provide a nice containment area for the ferric chloride tanks. Typically maintenance crews need to use high-pressure power washers for hours to clean solid waste from concrete surfaces. Since the polyurea provides waterproofing and has a cleanable surface, crews can hose down the clarifier to clean it; This can cut required weekly clarifier cleaning by two-thirds. For wastewater-related rehabilitation, polyurea is a superior coating for any application that requires crack bridging, longevity, chemical, and temperature resistance, as well as a fast turnaround.